1st Edition. Updated April 2019. So a talisman, amulet, or charm may be a physical object that stores and radiates a magical energy to designed to create change. It is important to understand that charms are generally items of folk magic and superstitions, such as a lucky horseshoe, a four-leaf clover, a rabbits foot, a babys caul or a bracelet of personal charms signifying important things in the wearer's life, and a charm can also be used to refer to a simple verbal spell. A metallic disk, stone, wand, sword, pen, paper, or television remote control can be a talisman provided that it is dedicated toward a "magickal purpose. The definition of magick, however, has successfully eluded occultists for centuries. In this work you are given instruction in how to create powerful talismans for each of the seven holy archangels which you may use in future rituals and as objects of personal protection. The design of these talismans has been taken from ancient sources and the images used in their creation traditionally attributed to each of the archangels. Besides being given detailed instruction on designing and creating your own unique talismans a number of traditional talismans are given for each archangels which you may use as invocation talismans for mundane requests to the archangels. This new update deals with more advance astrological election calculation for the generation of talismans. 1. 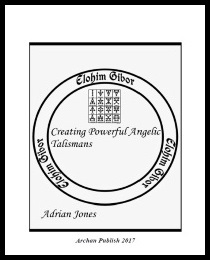 The creation of the seven angelic talismans for personal protection, meditation and as a ritual tool in future angelic communication. 2. How to create you own powerful personal talismans for everyday discrete invocations. 3. Besides being given detailed instruction on designing and creating your own unique talismans a number of traditional talismans are given for each archangels which you may use as invocation talismans for mundane requests to the archangels. 4. Full instructions are given, including the astological considerations for their creation.